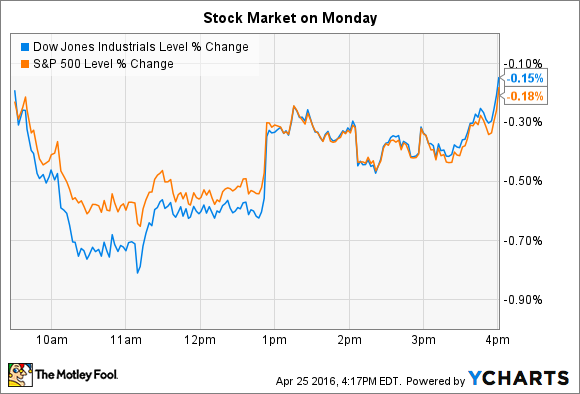 Why these two stocks posted big declines on Monday. Dozens of companies are slated to post earnings results over the next few days, including Apple, Procter & Gamble, and Facebook, and the Federal Reserve will make a highly anticipated monetary policy announcement on Wednesday. Meanwhile, stocks didn't move much in preparation for that mountain of fresh financial and economic data. The Dow Jones Industrial Average (DJINDICES:^DJI) gave up 24 points on the day, or 0.1%, and the S&P 500 (SNPINDEX:^GSPC) shed 4 points, or 0.2%. Individual stocks making large moves included Xerox (NYSE:XRX) and Advanced Micro Devices (NASDAQ:AMD), which both posted double-digit declines on Monday. Xerox fell 12% after posting Q1 earnings results and updating investors on the growing cost of its restructuring plan. Sales fell 4% to $4.3 billion, meeting consensus estimates, and earnings weighed in at $0.03 per share (down 84%, year over year), in line with management's target but just below Wall Street forecasts. The printing technology business suffered a 10% sales drop, compared with a 13% decline in the prior quarter. Profitability continued to worsen in that division, too: Segment operating margin fell to 10% from 13%, swamping the decent gains that the services segment posted. CEO Ursula Burns said results were hurt by weak economies across several developing markets but predicted that lower expenses will soon start boosting the bottom line. "We have accelerated our cost reduction efforts across the company and expect to begin realizing the benefits in the second quarter," Burns explained. Still, Xerox was forced to dial back its earnings and cash flow guidance to reflect mounting costs associated with the restructuring initiative and its proposed breakup into two companies. Free cash flow will be closer to $700 million than its prior $1.1 billion guidance, and GAAP EPS will be $0.50 per share, down from the $0.71 per share Burns and her team initially targeted. Graphics processor specialist AMD lost 11% on heavy trading volume as investors continued to digest the earnings results it published last week that sent the stock soaring. In addition to slightly better-than-expected operating results, the chip specialist revealed that it is forming a joint venture with a Chinese company aimed at the local server market. The deal will bring about $300 million of licensing revenue and might be followed by additional lucrative arrangements. "Our new licensing agreement is a great example of leveraging our strong [intellectual property] portfolio to accelerate the adoption of our technologies more broadly," CEO Lisa Su said last week. Investors also cheered the fact that profitabilty improved, with gross margin ticking up to 32% of sales from 30%. Yet the business is shrinking rapidly due to weakness across PC and notebook processor demand. Revenue declined by 19% million last quarter, which translated into an operating loss of $55 million (up from a $30 million loss the prior year). The company hopes to climb back into operating profitability later this year and in fact sees revenue rising by as much as 15% in Q2. However, investors can expect shares to remain volatile until it becomes more clear that its core business is stable and AMD is winning market share with help from new products like its Polaris GPU lineup.